As you can see there are 64 shares on the facebook post. You can see a huge difference of shares 64 on facebook and 183 Shares on our website. The reason is that shares on a facebook page and shares on a website are entirely different ones! Shares done via the share buttons are totally independant. They are not equal to the shares of a facebook post. Shares on a facebook post are done via the share function in facebook. Shares beside the MashShare Share buttons are the shares which are generated by clicking on the MashShare buttons. All share plugins are working that way. Its not possible to count shares of a facebook post and merge it with shares of your website. 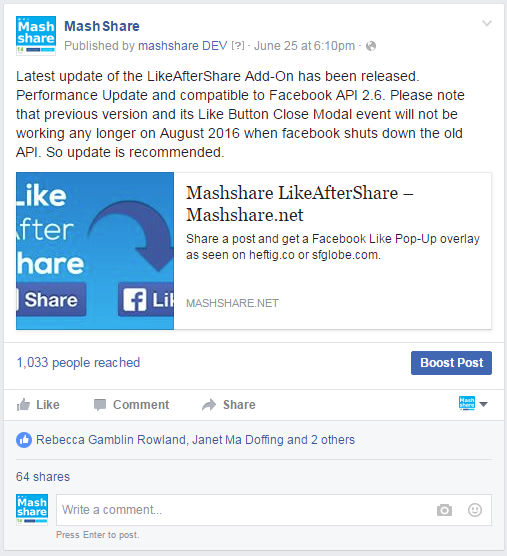 Any share numbers on a facebook post which is released on a facebook page is not counted. You can check and verify the share count which should be shown beside the MashShare Share Buttons with a service like sharedcount.com but keep in mind that these numbers can slightly differ because sharedcount.com is not counting all the networks MashShare is supporting. Any difference in numbers can also result from different caching time points.